This article is from JCK posted on September 1, 2015. I felt that it was important to note that nearly all of my necklaces include Swarovski Crystals which are mentioned on our cards. After reading this article I may look into finding a stamp which will identify that Swarovski Crystals are included. I would love to know what you think and get your feedback. With increasing deregulation across the global economy, it is difficult for consumers to know whom they can trust, especially concerning the quality of the ingredients in the products they buy. Ingredient branding is an excellent way for consumer brands to assure their customers about quality. Simply stated, a brand is created around a high-quality or performance-driven product component. Examples of ingredient brands that have become household names are Intel, Dolby, and Gore-Tex. They enhance consumer products with the added value of their special functions, and these products stand out from those of their competitors. This is especially effective in the jewelry industry, where ingredient branding with consumer-trusted brands is known to enhance the trust factor by providing transparency and adding value. Forevermark and platinum are well-known examples of this. At Swarovski, the ingredient branding program’s distinctive “Made with Swarovski” label is placed on products from independent brands that use Swarovski Zirconia, Swarovski Gemstones, or Swarovski Marcasite in their collections. The three ingredient brands are owned by Swarovski but licensed to carefully selected partners who want to ensure customers that their jewelry is made using premium-quality genuine gemstones and created stones, precision-cut from the finest raw materials, and manufactured according to the strictest standards. Swarovski’s ingredient branding partners also receive special services that help to strengthen their market position and brand identity. Point-of-sale support includes promotional materials, and training support helps retail sales staff understand the unique features of Swarovski Genuine Gemstones and Created Stones. Trend and design support includes advice on trends and suggestions for production and design solutions, while application support provides specific advice on gemstone-setting techniques. With such advantages, jewelry brands are increasingly turning to ingredient branding to differentiate their products and promote transparency in the eyes of the consumer. Judith Jack, Industrial Strength, and Judith Ripka for QVC are among a number of U.S. brands to trust the quality of Swarovski Genuine Gemstones and Created Stones and the effectiveness of the ingredient branding model. A Cambridge, Mass., man proposed to his girlfriend using a drone. We’re going to go ahead and call this the first-ever drone-assisted proposal, a nice reminder that the technology can be used for good. The drone delivered the ring to Andrew as he and his girlfriend, Sophie, took a walk on the beach; he took the ring and the drone flew away, recording Andrew’s proposal (Sophie said yes). A video of the proposal was produced by Above Summit Films, the company that also provided the drone. Above Summit is based in Somerville, Mass., and provides aerial videography for clients. To receive the latest jewelry news and blogs every day, subscribe to JCK’s e-newsletter here. This interesting Blog was published in the JCK Online Newspaper on September 8, 2014. It was very informative and I loved the unusual scope of the article. Archaeologists in the U.K. have uncovered a collection of 1st-century gold and silver jewelry thought to be the finest discovery of Roman jewelry in Britain’s history. 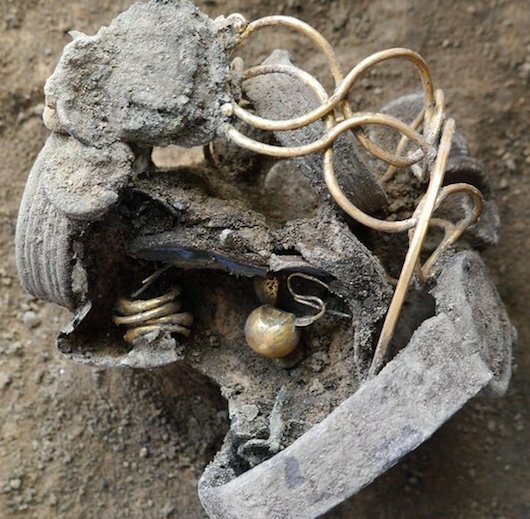 The find includes “three gold armlets, a silver chain necklace, two silver bracelets, a substantial silver armlet, a small bag of coins, and a small jewellery box containing two sets of gold earrings and four gold finger-rings,” according to the Colchester Archaeological Trust, which discovered the hoard. Adam Wightman, site supervisor for the trust, uncovered the jewelry during an excavation at the Williams & Griffin department store. The trust was hired by the store’s owner, Fenwick Group, to excavate the area in preparation for a planned redevelopment. The jewels were found buried under the floor of a house that was burned down, along with the entire town of Colchester, during Boudicca’s Revolt of 61 CE, when the Iceni tribe, native Britons led by Queen Boudicca, rebelled against Roman occupiers. Fenwick has announced plans to give the jewelry to the Colchester and Ipswich Museums Service.